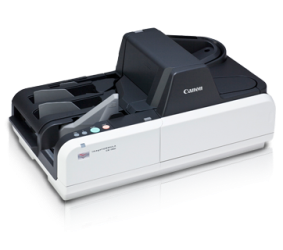 When accuracy, speed and quality are important, the Canon imageFORMULA CR-190i / CR-190i UV offer the ideal solution. Advanced features like MICR supported by OCR ensure consistent batch scanning of cheques, vouchers and coupons. The CR-190i UV offers the additional benefit of UV sensors that help prevent cheque fraud. High-speed scanning: up to 190 cheques per minute. Precise simultaneous reading with MICR and OCR. High-quality imprinting via the 4-line built-in imprinter. High-speed scanning - The imageFORMULA CR-190i / CR-190i UV has been designed to offer banks and retailers fast, efficient and reliable scanning. Simple to integrate -The CR-190i / CR190i UV fully support ISIS / TWAIN interfaces allowing organisations to use the devices with a range of scanning applications, CR-190i / CR-190i UV also support three types of SDK, while Silver Bullet Technology ’s Ranger Transport API software allows the CR-190i / CR-190i UV to be easily integrated with new or existing systems. Easy to maintain - Side opening makes maintenance tasks like cartridge changes, paper jams and cleaning simple to accomplish. High-quality outputs - Fine Text Filtering captures images accurately, even from documents with patterned backgrounds, to ensure best quality. Flexible imprinting -A 4-line built-in imprinter for high-quality bitmap images and text gives you a flexible choice of imprinting capabilities. Accurate reading - MICR supported by OCR ensures a high standard of image reading. Versatile performance -The CR-190i / CR-190i UV ’s high-volume document feeder accepts up to 250 documents at a time; while the built-in jogger assures continuous jam-free scanning. Helping banks prevent fraud -The CR-190i UV is equipped with UV sensors that can scan anti-fraud patterns printed on cheques with UV ink. It allows two images to be captured simultaneously – a black and white or greyscale image and a UV image –at a high-speed rate of up to 160cpm.